"Hey look, it's Abraham Lincoln!" Natalie said, pointing as we walked up to the Gettysburg National Park. "I'm sorry you got shot," she added as we walked by. We recently returned from a trip to Gettysburg, and let me tell you, it's a gorgeous town. The grass was emerald green. The sky was robin blue. Fluffy white clouds dotted the sky. The temperature was pleasant in the 80s, a welcome reprieve from the 100 degree temperatures we've been having in Texas. My husband has always been intrigued by Gettysburg. His Dad was too, but unfortunately his Dad has passed away and never got to visit Gettysburg. So I knew his Dad was on my husband's thoughts. I was also eager to explore Gettysburg--I've always been fascinated with history. 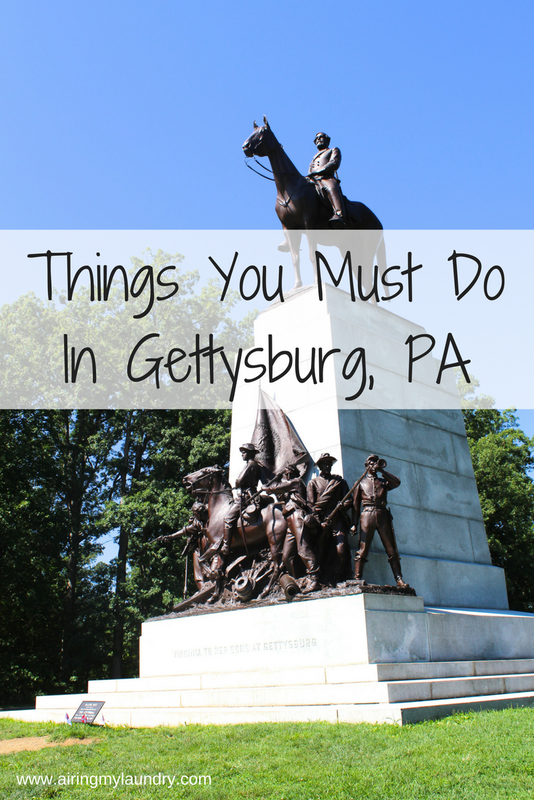 If you've never been to Gettysburg, well, I have ideas on what you must do if you go. 1. 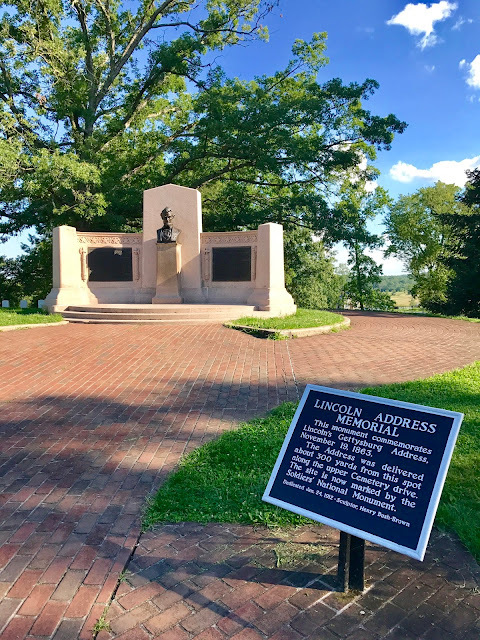 Check out the Gettysburg National Military Park first before heading for the battlefields. You learn different ways to explore the battlefields. You can take a bus tour. You can hire your own tour guide to ride with you. Or you can do as we did and take the auto tour. They'll give you a map on how to drive around and you get to go at your own pace. There's also a museum there, and active duty military members are free. 2. Take the time to read about the battles. There are usually signs out at each spot explaining exactly what went on. This was helpful for me, because my knowledge of Gettysburg is a tad rusty. 3. Check out the Soldiers' National Cemetery and see the Lincoln Address Memorial. "So this is where he went 'Four Score and Seven Years ago?' Natalie asked. "Oh and look, it was dedicated in 1912. That's when the Titanic went down." 4. 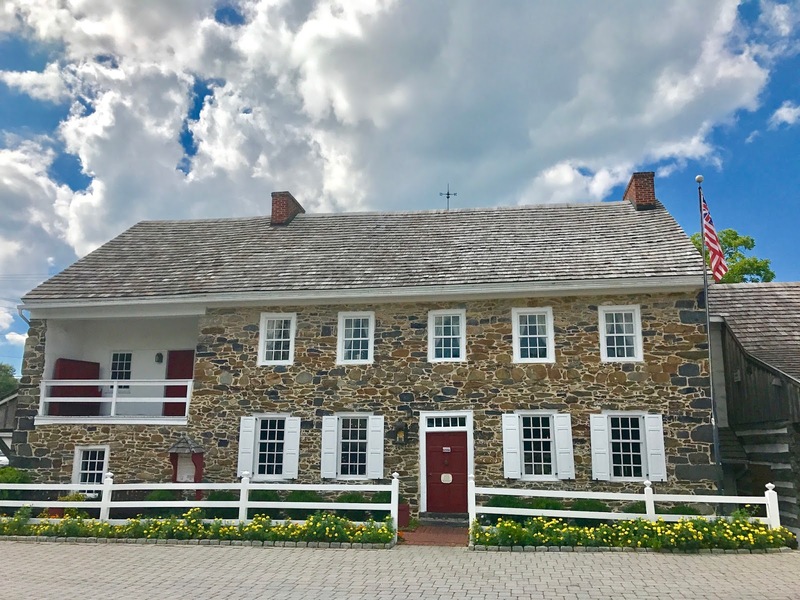 Eat at an old house! 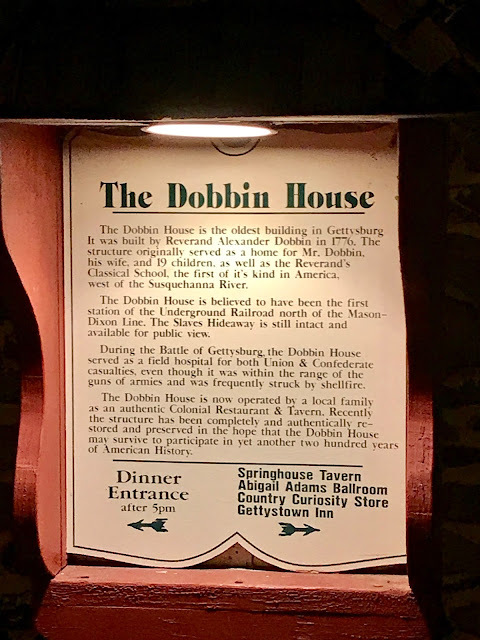 We decided to check out the Dobbin House Tavern. There are several in the area, but this was closest to our hotel. The French Onion soup is AMAZING. Get it! 5. Check out the Sachs Covered Bridge. It's gorgeous. It's about two miles from the battlefields. Yes, it's historic. Civil War armies marched on it. 6. Do a ghost tour at night. 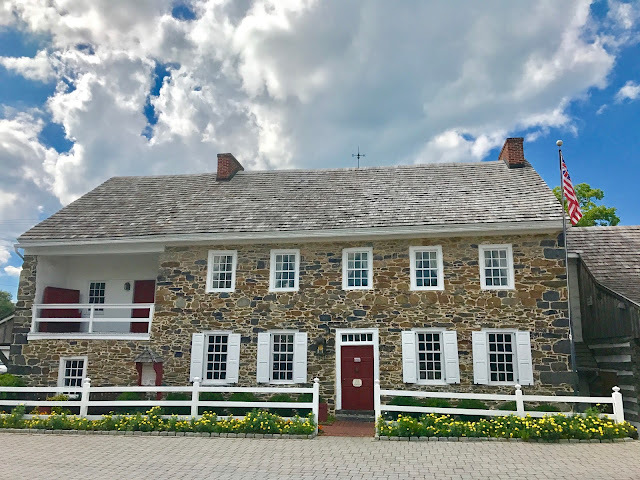 There are lots of options, and we went with Gettysburg Ghost Tours because they had fabulous reviews on Facebook. It didn't disappoint. We did the Battlecry Tour. It wasn't too spooky, it was mostly stories about ghosts. My daughter is 10 and wasn't frightened at all. I saw kids younger than her as well. You get to walk to various places in town and hear spooky tales about where ghosts have been spotted. 7. 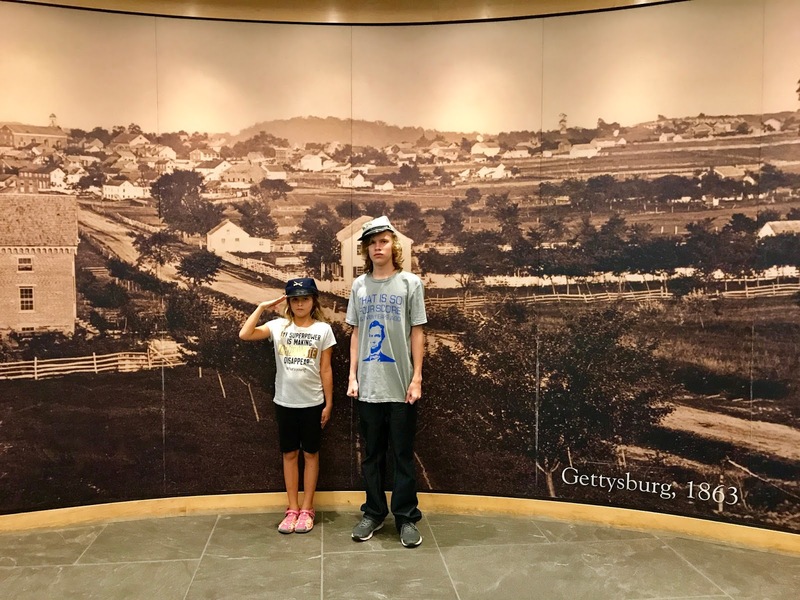 Go to the museum at the Gettysburg National Park. 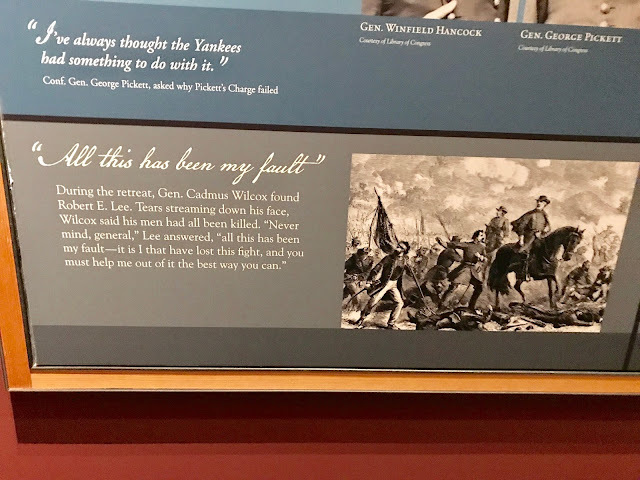 There are many interesting exhibits and it goes into the entire Civil War, not just Gettysburg. I know. My husband SO has the face for that era. Natalie's all, "I just loved my hat. I felt like a lady!" 9. Take it all in. At first you'll marvel at the beauty. But then you'll remember what happened there. You'll remember that there were bodies all over the fields. There were people screaming in pain. People who mattered. Have you ever been to Gettysburg before? I've always been intrigued by Gettysburg too! So much history and such a beautiful town. Your daughters conversation with Lincoln was priceless though! 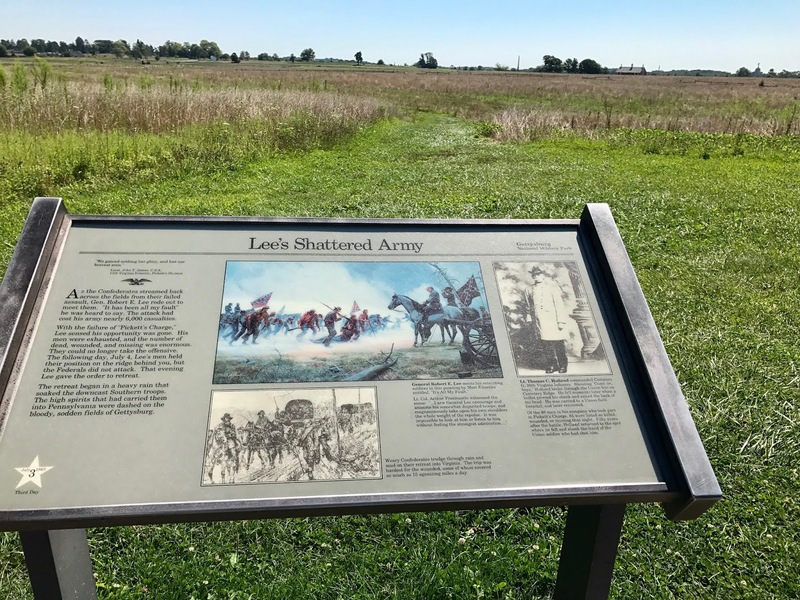 It sounds like an important place to visit and learn about Civil War history. It really does doesn't it - I'm not from the US but history fascinates me so I would love to visit myself. Thinking we had better make a trip to Gettysburg before the crazies tear it down and destroy all the wonderful history that makes up our country. Gettysburg is a place of history that I would love to see you. I am hoping that at some point in future I can go there with my kiddo and teach them about our history. The picture you took is incredibly cool! I love trips and vacations that incorporate history so I am putting this on our list of road trips. PA is about 7-8 hours away so we can totally do it! Thanks for the inspiration. That street sculpture looks very interesting. I have never been to Gettysburg, but it is a place that I've always had an interest in visiting. I definitely would have to do a ghost tour! Haha! Gettysburg is so culturally rich and still has a lot of people manning the area. It would be nice to see the finished product. This just sounds amazing and what Natalie said to Lincoln is pretty funny. I went when I was little, but I've been meaning to go back for sure. There is SO MUCH to see and do there, and looks like you guys did a ton of it! I can imagine that going to Gettysburg is an amazing and very touching thing to do - I would love to be able to go myself. I've never heard of Gettysburg! The location and scenery looks amazing! So many education sights and so much to see. I assume you can have a pic nic within this park. Looks like so much fun! Love the fact that many of the sites have a historical element to them - great for educational trips with the family! We love visiting PA and I don't think weve been in gettysburg. It sounds like there is a lot to see and do in this town. Id love to visit one day. I can't remember if I went as a kid or not! But looks awesome!!! Love the covered bridge! 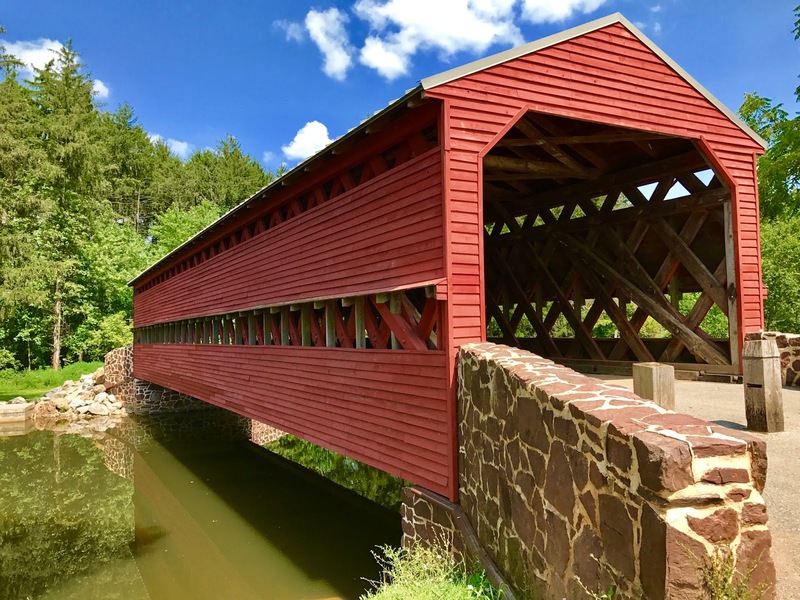 It seems like a beautiful town.I will sure attract to visit an old house for lunch.And the covered bridge is fascinating! It is always nice and more fun to visit historical places and houses. They are full of authentic stories and still a mystery even nowadays. The "I'm sorry you got shot" made my heart melt! There's a puddle of chelf on the floor. She is so cute and also so lucky to have you! You've been organizing so many fun and educational stuff for the kids! This seems to be such an amazing place. It's great to be outside and also learn something about your country! I was supposed to visit Gettsyburg two weeks ago with my girls, but came down with a kidney stone. Now I can use your list when we head back! I've never been to Gettysburg although PA isn't terribly far from us. I would skip the Ghost Tour because I'm scary but visiting the Lincoln Address Memorial is cool. We missed our opportunity in seeing the Gettysburg last time we were in PA but we will definitely go back to see it. There's so much to learn in that place. This is great! I really want to take the kids here. Gonna pin it for future! It's nice to learn more about historic places so far away from here. I love your kids words to the statue, so cute! We were in the US for almost 5 years but never got a chance to visit PA. It looks like fun. Thanks for the virtual trip. The French onion soup actually got my attention. I would live to visit Gettysburg one day. The French onion soup actually got my attention. I would love to visit Gettysburg one day. Aww that is sad about Tom's dad! I'm glad you guys took this trip. It's like his spirit lives on. I would all be about eating at that old house, and doing a ghost tour! My husband grew up in PA and he has been there several times. I have never been, but dream about it. My husband would love to visit Gettysburg. He is such a history buff and I know he'll enjoy being there. I love the photo of your family. Definitely a keepsake. No, we haven't been to Gettysburg yet. However, looking at your photos and reading about the place makes me want to go there the soonest. The covered bridge is so beautiful, and the cannons are very well preserved! Wow. Ive never been to Gettysburg, but it's somewhere I think my husband and son would love to see. Lots of history there. I have always wanted to find the time to visit Gettysburg. It is just filled with so much history. I remember being in that museum very vividly. And then I remember going on a tour out there and seeing where Pickett made his fateful charge. Was all incredible. There's soo much history! What a fun time to be had by the whole family - that's the best part! I've been there once I believe, but I don't remember much so I should get over there again, I'm pretty close in NY! 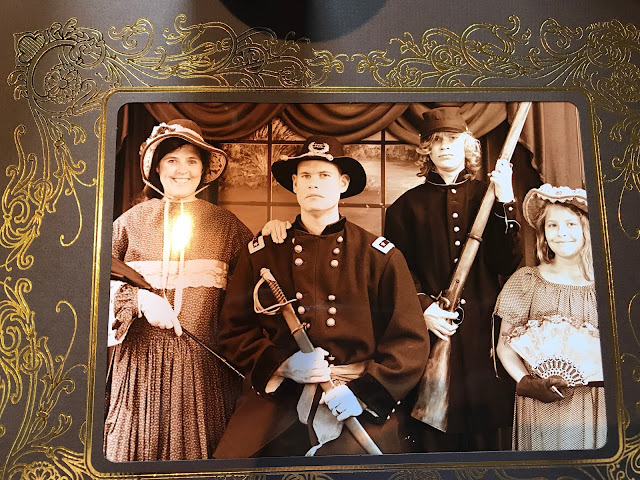 It sounds like you all had a wonderful time at Gettysburg in Pennsylvania. We would love to visit there some day for the history of the area. My family love history and you can always learn more along the way too. Thanks for sharing your experiences. I'm a real history buff, so Gettysburg is definitely a place that I would love to visit. I went to Gettysburg when I was around 13 but I couldn't tell you anything about it. I've always like seeing historic sites though.